We will manage the entire compensation process, from start to finish. The following information has been created to provide further insight on the car accident injury claim process. During the initial consultation you will be asked about the car accident, how it happened, the weather, the driving conditions, the speed of your vehicle, other vehicles involved and police reports. You can expect an informal conversation about the initial hospital visit and doctors’ reports, your injuries and ongoing medical reports, the symptoms of your injuries and how your life has been affected. We will ask about insurance policies and any communication you have had with your own or other insurance companies. If you choose to work with us, you will need to sign forms giving our lawyers permission to access medical information, police reports, insurance and other pertinent documents. Trial requires many hours of legal expertise to research and win the case. Our lawyers need to do a quick overview to determine whether or not you have a case and if there is enough evidence and damage to bring your claim before the courts. This decision will likely be decided once the initial consultation evidence is reviewed. We will go through what you can expect each step of the way. You will be warned of pitfalls and given recommendations that will help you protect your rights to compensation. You may have legal and non-legal questions that are injury related. We can answer those for you. Over time, you will have questions that will no doubt arise. We take great pride in our client service. We will manage the entire compensation process, from start to finish. We deal with the insurance companies so you don’t have to. We go to great lengths to communicate effectively and insure that we are always available to answer questions throughout the entire claims process. Once you have given us permission, our lawyers will immediately investigate the accident scene, seek to acquire physical evidence, photos of damaged vehicles, accident/police reports, past and present medical information, road conditions and insurance policies. Our lawyers will look to establish negligence, fault and causation. Witnesses will be interviewed and may be asked to provide a detailed account of the accident. Our lawyers will quickly seek to preserve as much supportive evidence as possible. The sooner this happens the stronger your car accident injury claim will become. If the responsible insurance company feels that it has considerable exposure in relation to policy obligations – they may seek to settle the claim before discovery or negotiations have been conducted. Often times when this happens, the extent of your injuries and losses are not fully apparent or medically documented. You should always seek legal advice before signing anything from the insurance company. If a satisfactory settlement offer has not been received or compensation has been denied; our lawyers will prepared and file a notice of civil claim (car accident lawsuit) on your behalf. Based on our detailed investigations, our lawyers will decide who is named in the lawsuit. This is an important detail; along with the other driver there may be other negligent parties that contributed to the accident. This may be in the form of contributory negligence bars that over-served the vehicle operator, or a person that negligently entrusted their vehicle to an impaired driver. The defendants and their insurance company must file their response within 21 days. If this does not happen the courts may without further preceding pass judgement in your favor. Documenting your injuries is an important part of the litigation process. Your lawyer will give you access to highly qualified medical specialists, occupational therapists, forensic accountants and other rehabilitation professionals. These professional will diagnose, document and treat your injuries. Claimants are required to attend medical examinations requested by the responsible insurance companies. It is important to note that these insurer medical appointments are not intended to treat your injuries. The intent of the appointments are to establish your credibility and the validity of your injury claims. These can be stressful and exhausting events for those who have suffered serious injuries. Your lawyer will advise you on what you can expect in each of these appointments and may even decide to be present during examinations. Having good communication with your lawyer is very important with regards to these appointments. Oral depositions may be conducted by your lawyer in efforts to support your claim. These may come by way of family members, accident witnesses, employers, work colleagues or other relevant persons. The discovery process provides the parties involved in the dispute opportunity to gather and assess the strengths and merits of the oppositions case. Our lawyers will advise you on the Discovery Process and what you can expect prior to this event. The discovery meeting will likely involve you the injured plaintiff, your lawyer and the defendant(s) and their legal representatives. Each side will be given the opportunity to ask the other questions regarding the accident, your injuries, your losses etc. The questions asked must be relevant to the action in dispute. It is common for defense lawyers to push boundaries with their line of questioning. If this happens, your lawyer will likely instruct you not to answer. Answers that all parties give will be under oath. There will be a third party reporter that will transcribe this pre-trial procedure. Relevant documents such as accident photos, will likely be requested by each side. Depending upon the documents requested, your lawyer may refuse certain requests. This discovery meeting is usually a one day event, but may be as long as two or three depending on the circumstance. Mediation is a form of alternative dispute resolution (ADR) that usually take between 1-2 days. The mediator is often a retired judge or qualified neutral third party. Mediation for a car accident injury claim can take place at anytime throughout the process. The majority of meditations take place between one and two years from the date of the accident. This is often dependent on the severity of the injuries suffered in the accident. Rushing into mediation before signs of recovery or before injuries have reached a plateau is not a good idea. It is also not advisable to enter into the mediation process before a trial date has been scheduled. The closer a set trial date is to the mediation, the more likely the dispute is to be resolved by this preceding. Attending a mediation without a trial date on the “doorstep” is a strategic error (See article:Negotiating your personal injury claim within the “Shadow of the Law”). This gives the insurer the opportunity to “see all your cards” so to speak, with ample time to delay and prepare before deciding to settle or go to trial. Throughout Ontario, many jurisdictions such as in Toronto, mediation is a mandatory pre-trial procedure. If a fair settlement is not reached through the mediation process, your appointed team of lawyers will not hesitate to litigate your claim in court. Without the threat of litigation justice unlikely .If your claim does not settle at mediation, the next step is the pre-trial conference. 1.The judge will have counsel and parties and insurance representatives in a boardroom for an initial meeting, at which typically only the judge and the lawyers have anything to say. The parties and insurance representatives will then be asked to leave and will wait in the hall while a further meeting takes place with just the lawyers and the judge. 2. The other possibility is that the judge will hold a meeting in chambers for only the judge and the lawyers, and the parties and representatives will not be invited in. They will simply wait in the hall and never see the judge. Different judges take different approaches and the availability of a boardroom also can play a role in how things take place. If a adequate settlement was not reached through alternative dispute resolution or other negotiations – your lawyer will present your thoroughly documented case before the courts. Every aspect of your case will be supported with solid evidence. Evidence may be in the form of expert witnesses, medical documentation, demonstrative evidence, accident reconstruction reports, surveillance, driving records, patterns of behavior to name a few. Your lawyers will look to establish your credibility, prove negligence and give the jury an accurate account of the impact the motor vehicle accident has had on your life. This is where having a experienced, prepared and knowledgeable lawyer matters most. Your lawyer must be a confident and persistent advocate with the ability to accurately communicate and persuade. Financial compensation awards obtained through the car accident injury claim process (tort action) are non taxable. Funds are usually received by the plaintiff within thirty days of a settlement or verdict. It is very important not to confuse an injury claim lawsuit (tort claim) with no fault accident benefits. For more information on the difference please visit our car accident benefits vs. car accident lawsuit page. 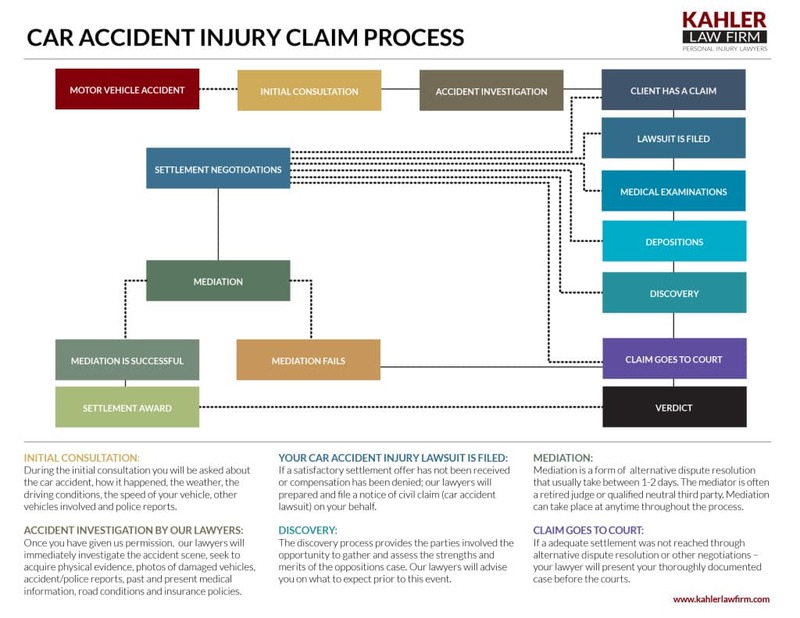 Starting your car accident injury claim with the Kahler Personal Injury Law Firm is an easy and straight forward process. All you need to do is call us directly on our toll free 24/7 helpline; or fill out the online consultation request form that can be found by clicking the “start your claim now” tab on the top right hand side of this website. At The Kahkler Law Firm, we have a reputation for successfully and relentlessly protecting the rights of our clients. Our initial personal injury claim consultations are always free of charge. If you are too injured to travel. Our lawyers will come to you or meet with you at a location of your choice. There are never any legal fees until we have successfully recovered your compensation.